Canada and the United States have not fought a war against each other officially since 1814, but in 1839, there was a “war” of sorts fought mainly with fists and axe handles. It was along the New Brunswick–Maine border and the warriors were lumbermen. Hence, it is known as “the war of pork and beans,” or the Aroostook Controversy. The root of the problem was that the border had never been clearly identified. The King of the Netherlands was asked to arbitrate, but his recommendations were rejected by the United States immediately, and later by Britain. Logging along both sides of the border was controlled by powerful lumber barons who were not always careful about the areas into which they sent their gangs. One of the barons was “General” Sam Veazie, who owned a railroad and fifty sawmills. Most of the trouble was in the richly pine-clad Aroostook Valley, now one of the finest potatoe-growing districts on the continent. The worst battle broke out on February 8, 1839. Under normal circumstances, the fighting among loggers might not have caused much alarm, but the situation was dangerous because of the dispute about the location of the border. Furthermore, the rebellions in Upper and Lower Canada in 1837-1838 had led many Americans to believe that Canadians wanted to join the United States. Maine and New Brunswick called out the militia. Nova Scotia passed an appropriation for defense, and British troops were rushed from Halifax to guard the border along St. Croix River. The United States Congress voted $10,000,000 to raise a force of 50,000 men if required. Fortunately, London and Washington realized the seriousness of the situation. President Van Buren persuaded the Governors of Maine and New Brunswick to arrange a truce. 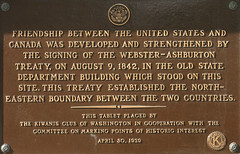 Britain and the United States then took steps to agree on a border, and the Ashburton-Webster Treaty provided a settlement in 1842. Interested in learning more? One place to start would be Aroostook War by Scott Michaud; the Border Dispute, with maps; and of course, there’s Wikipedia. A few miles south of Orono, Maine (where I went to the university) is the small town of Veazie. I’d heard it was named for an official of the Maine Central Railroad. Thank you for adding more historical enlightenment. Have you heard of the Pig War of the 1850s, happening on San Juan Island in Puget Sound? It was about a boundary dispute between the U.S. and Great Britain. Captain George Pickett (who later led the infamous charge for the Confederacy at Gettysburg) was sent from nearby Fort Bellingham to intervene. Some years later, Kaiser Wilhelm of Germany was called upon to arbitrate, and a boundary was drawn up that separates the American San Juan Islands from the Canadian Gulf Islands. And the skirmish started when an American named Lyman Cutler on San Juan Island shot a pig, owned by a neighboring English settler, for raiding his garden patch. According to a song on the subject, the hapless pig was the only casualty or the war. This was very interesting. I didn’t have a clue. This is why I like your blog…I learn things from you. Thank you, Jean, that’s very nice to hear! My Saturday reading and I can’t even open the links. Darn it. I’ll just use my imagination then. Who is the Pork and who is the Beans. BTW, congratulations on your award as I was reading the comments. Good day, eh. Borders with resources, such as timber harvest are tricky. Someone wants to take as much out as possible, but once the resource is gone it cannot be reclaimed (at least trees will grow back in a generation or two). Also, once a property line is crossed, the violator has set a precident, which if not responded to gives permission for the tresspassing to occur again, and possibly loss of property rights over time. I repaint my propety lines every few years, and walk them annually. At times I have taken down “No Tresspassing” signs which other land owners have placed 5′ to 30′ on my side of the line. Thank you for your insight … Wow. Interesting quote from Ashburton.Pork and bean wars, class wars, border disputes…Yikes! This is so funny. Great find. More interesting books to put on my list – thanks. I lived in Maine for several years, but never made it to Aroostook County. I do know that geographically it is extremely large, bigger than Connecticut and Rhode Island combined in terms of square miles.